A really well made pot, in my opinion, is one which you want to pick up and use. As I explained in my post on the value of handmade pots a couple of months ago, a skillful potter is one who crafts pieces that heighten your experience of eating and drinking. 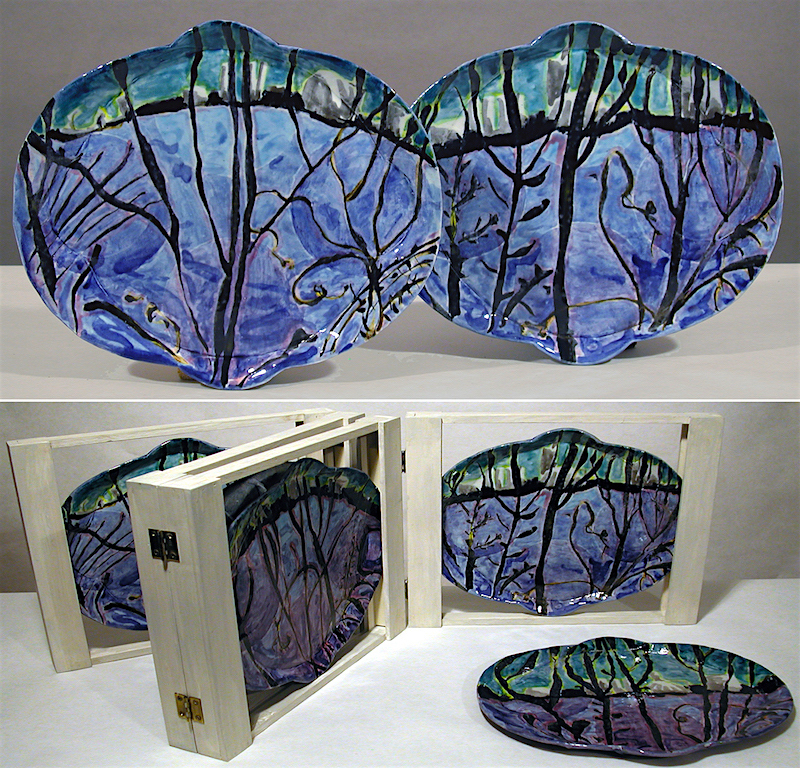 Larry Bush is such an artist and his pots are among my very favorites to use. Food looks great in them and I never tire of their shapes, surfaces, decoration or inventiveness. I first saw Bush’s work when he was a graduate student in the mid-1980’s at Alfred University in upstate New York. 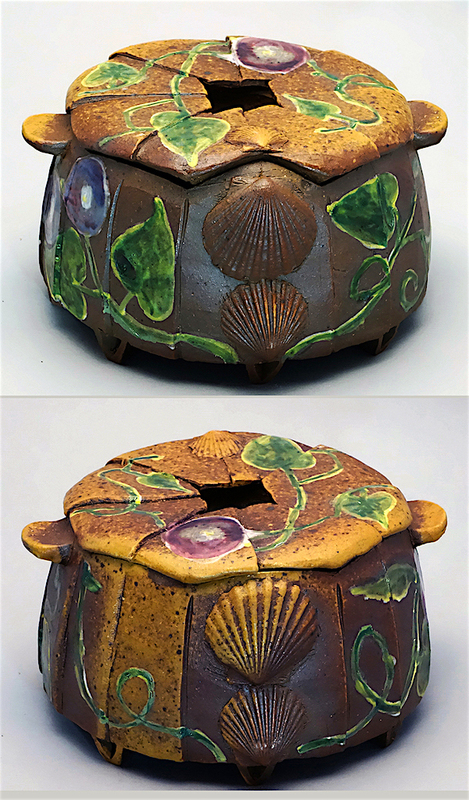 At a time when “vessels” and kiln sized clay sculpture were dominating the clay scene, Bush made human scale, useful pots that were artistically and technically sophisticated while being down-to-earth functional. His pots, like the potter himself, were smart, direct, friendly and thoughtful. Nature was an early source for Bush, a Seattle native, providing structural and decorative source material that still inspires him decades later. 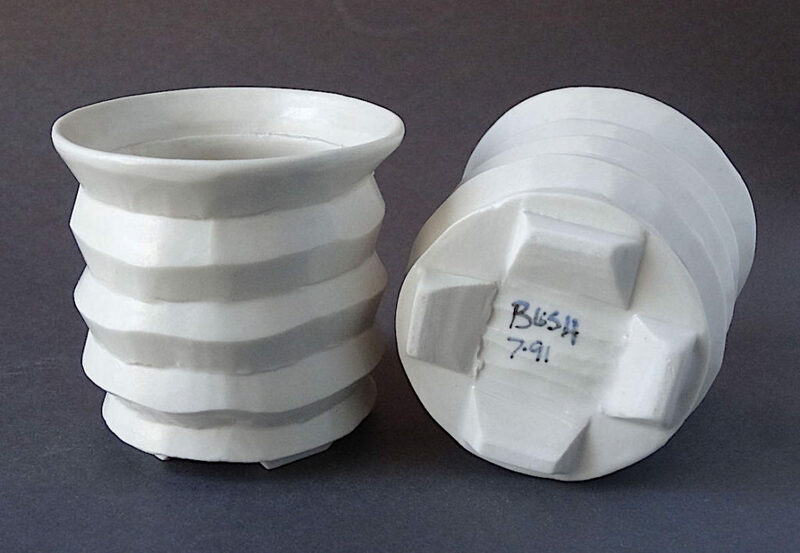 As a professor, and for many years as department chair at RISD in Providence, RI, Bush worked with a mid-temperature porcelain clay, casting a variety of objects to generate forms and then carving to vary the surfaces. 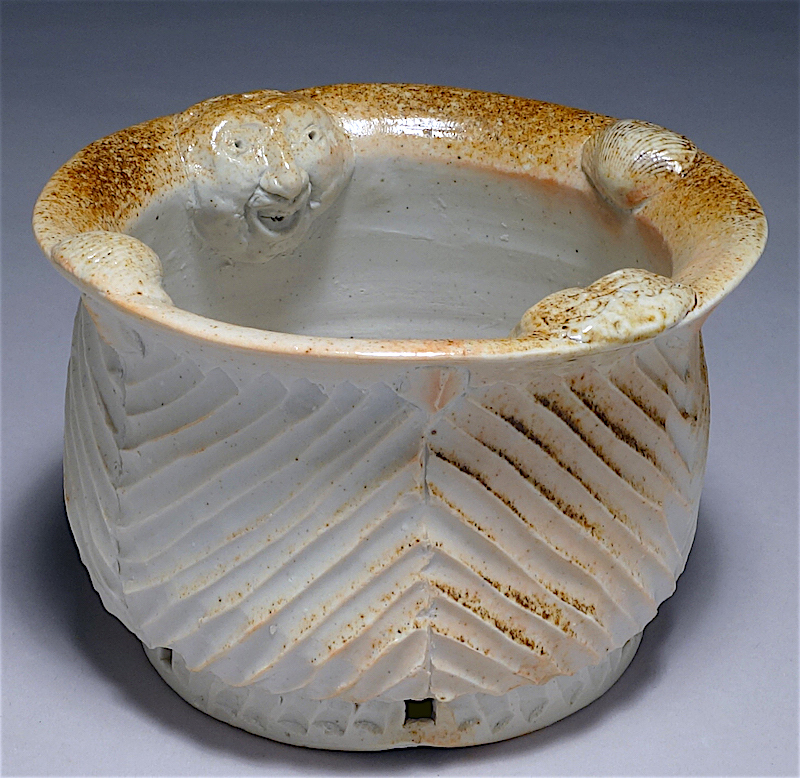 His pots became more delicate and deeply textured but retained a distinctly handmade touch. 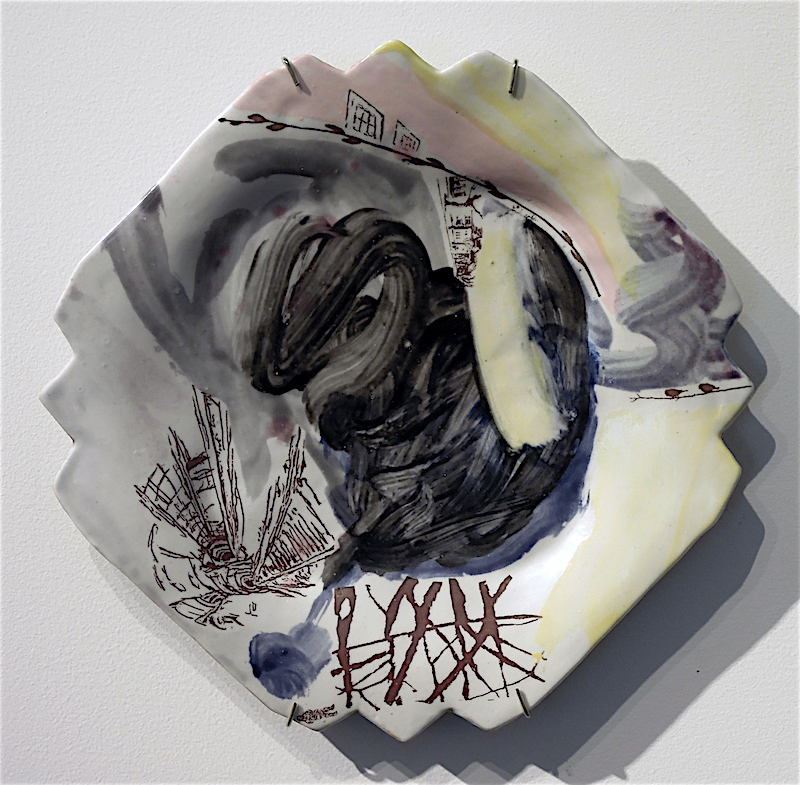 In recent pieces, he continue to use natural sources and historical references, going back and forth between a darker stoneware clay with flowers and vines for forms and/or decoration and carved or whittled porcelain. 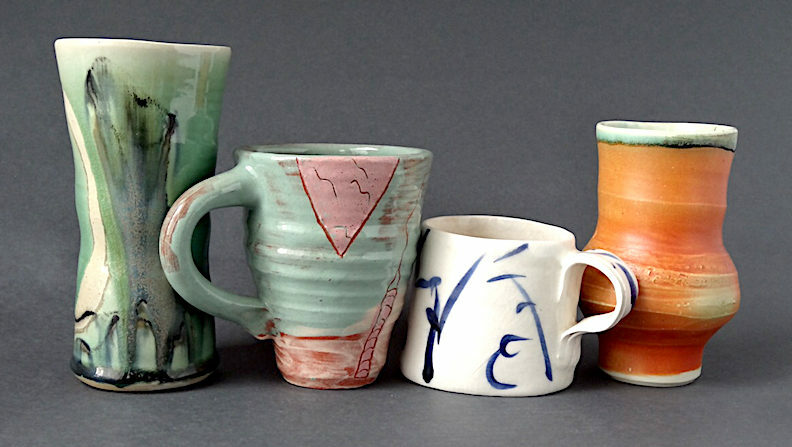 In either format, his pieces make having a cup of tea or coffee (or a sandwich) a pleasure. In a 2006 statement, Bush reflected on his inspiration. “Nature is my model, sometimes literally, always conceptually. 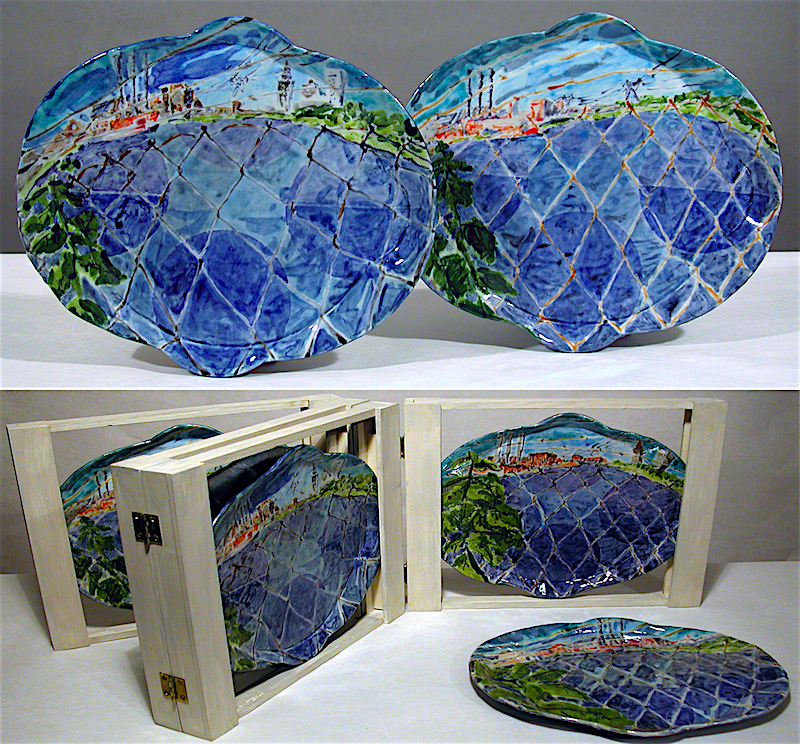 With clay and glaze I imitate nature. With function and form, color and texture, history and need, I attempt a layering of forces similar to that found in natural things like flowers.” He notes that the geological characteristics of a clay can determine how it is used, stylistically and in terms of function. 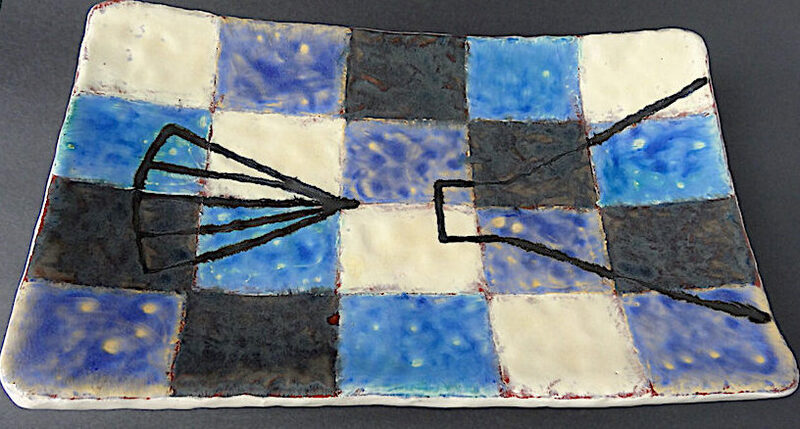 The darker stoneware serves one purpose and the porcelain another and going back and forth between them leaves open more possibilities for him to explore ideas. His depth of thought might not be obvious when you first see Bush’s work, since it has such immediate visual appeal. But the longer you use his pieces, the more you find yourself repeatedly surprised by the layers of references beneath the skillfully formed surfaces, whether carved or painted or both. The morning glory vines spreading over a generous jar (with proportions like an ancient Iranian prototype) prompt me to think of a sunny summer morning in a garden or a painting by Bonnard or Vuillard. The accordion like ridges of a white porcelain tumbler keep my eye moving up and down the pot while providing a good grip to prevent it from slipping out of my hand. Handles and rims are designed and articulated for maximum comfort in the hand or mouth. 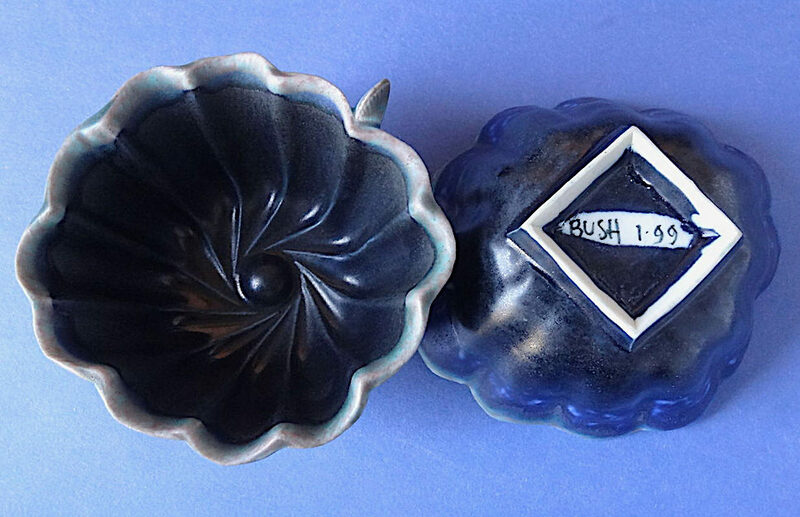 I’ve used Bush’s pots for 30 years, acquiring one or two whenever I had a chance, although it isn’t that easy to find them for sale. Because he teaches full time during the school year, the bulk of his own work waits for the free time of summer. Bush always has multiple projects going. When I spoke with him last summer, he was figuring out an in ground watering system for his garden, working on a series of plates (recently shown in art galleries in New York and Philadelphia) he was making as part of a collaboration with printmaker Andrew Raftery, writing student recommendations and configuring new kiln furniture so he could fit more work into each firing. Whether for a cup of coffee, a bowl of cereal or a martini, Bush’s pieces are unabashedly functional without any compromise of art or design. His recent food storage jars have recessed knobs so they fit more easily in the refrigerator. His “to go” cups are designed to prevent coffee from splashing out while feeling comfortable for drinking and being aesthetically engaging. 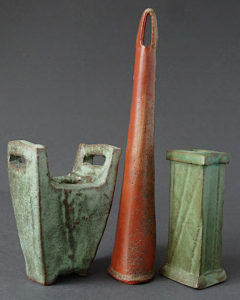 In each of his bodies of work, utilitarian and decorative elements reinforce each other, resulting in pots that please the eye and feel good in the hand. These are pots you want to pick up and which you will want to use because they are so well thought through, crafted and artful, heightening our experience of eating and drinking. 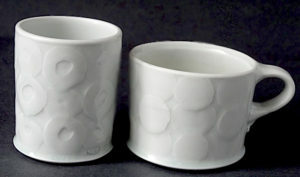 Lively yet intimate pieces whether on a shelf, in your hand or drying in a dish rack, Bush’s pots are a pleasure to use. 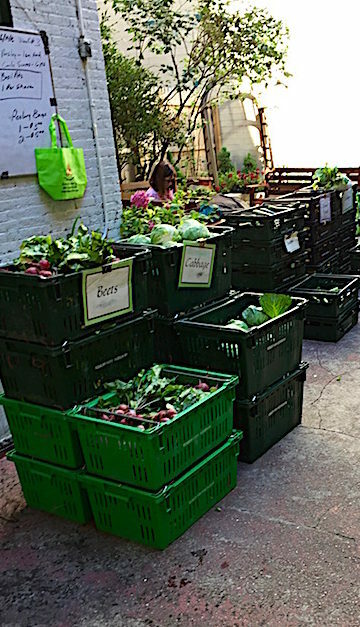 Community supported agriculture (CSA) is a partnership in which individual farms are supported by customers/members who pay up front for a season of vegetable deliveries. We have belonged to a CSA for 21 years, since our son was born. Our first farmers, Hugh and Hannah from Threshold Farm, stopped making city deliveries after 7 or 8 years to concentrate on their local community and their orchards (but we have followed their progress and family over the years and still buy delicious apples, dairy products and vinegar from them when in Columbia County). Our current CSA – Roxbury Farm, to which we have belonged for more than 10 years now, was one of the first to start coming to New York. 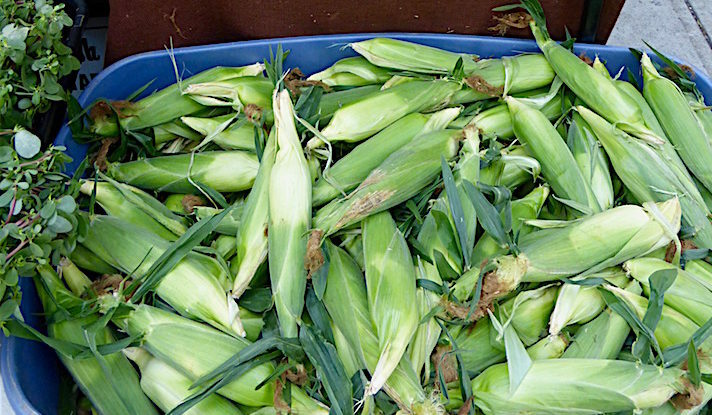 We receive not only amazing vegetables every year, but also learn so much about farming and the farming life from their thoughtful and insightful weekly newsletters, including recipes for each week’s bounty. Our current farmers are not only organic but also biodynamic (as were the first), so they farm without pesticides. Their knowledge and practice provide us with a steady source of nutritious and tasty food, including their own lamb, pork and beef which can we order from their website. Every week we pick up whatever 8 – 12 vegetables they picked that that were ripe that week, except in the fall when there are squash, garlic, and onions, etc. that have been aged appropriately so we can store them. We get everything from sugar snap peas, scallions and asian greens like mizuna or tatsoi to basil, dill, cilantro and parsley to tomatoes, broccoli rabe, sweet corn and buttercup squash, to name just a few. 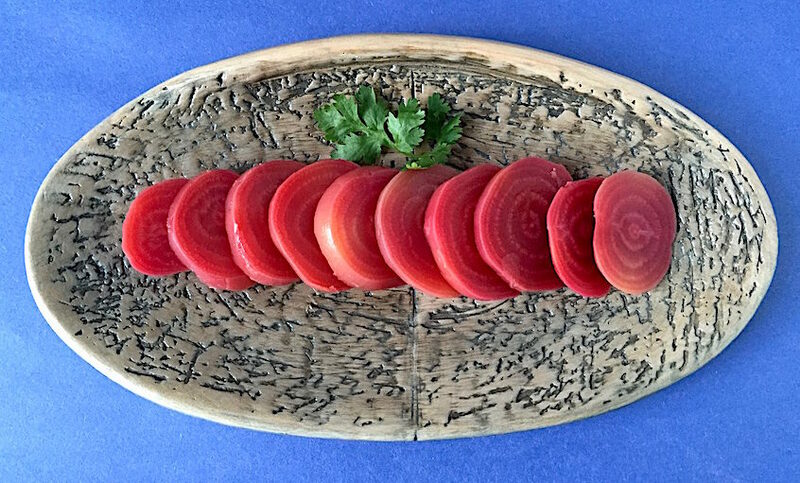 Since we get whatever they grow, I try things I might never have purchased because I wasn’t familiar with them or didn’t think I liked, such as beet greens, celeriac, and Swiss chard, all of which I now have learned to prepare and enjoy. Because their newsletters keep us informed of their weekly struggles (like equipment, insects and the effects of weather on crop outcomes), as well as interesting essays on farm life and work, our farmers have become the rock stars of our summers and autumns; They provide us not only with produce but also remind us of the hard work and commitment demanded in cultivating the land, growing, harvesting, and delivering those vegetables. 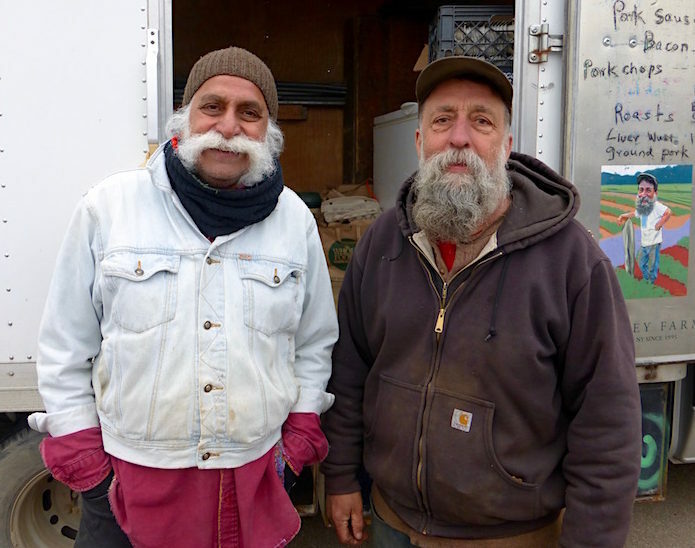 We feel deep gratitude to Jody and Jean Paul, and their crew, as we collect our share each week and when we eat it. In recent years, we have subscribed to their winter box program, a 30 lb. 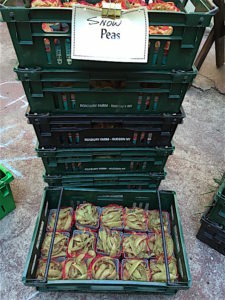 box of winter storage vegetables that comes monthly December through February. That means we have local carrots, beets, cabbage, onions, sweet potatoes, celeriac, garlic, watermelon radishes, squash and potatoes for most of the winter. All I have to do is supplement with greens or frozen veggies until the spring crops appear at the farmers markets. 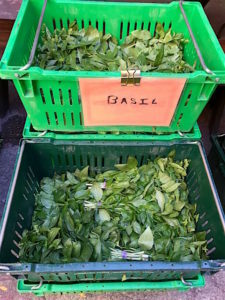 If you are interested in joining a CSA, check out the Just Food website – justfood.org/csaloc – for NYC. For locating a CSA in the tri-state area, localharvest.org is a useful site. Different states and areas of the country have their own websites. Just search CSA and the name of your state or part of the country. Or try https://pubs.nal.usda.gov/organizations-and-websites-related-community-supported-agriculture. It’s an easy way to support local farms, get fresh, local produce directly from the farmers and connect to a community of people who care about well grown food and the people who provide it. Tomatoes are ripe and tomatoes are Ray Bradley’s specialty. 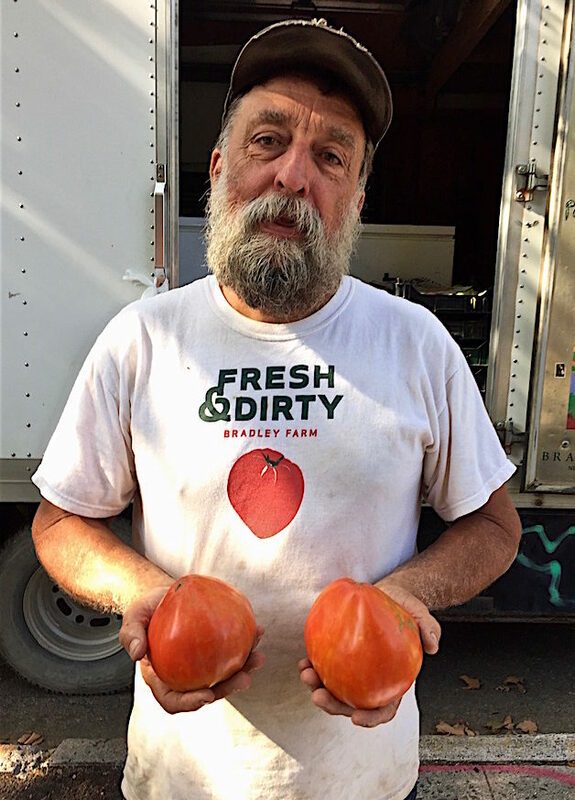 According to Bradley, the New Paltz chef turned farmer who grows and sells many different vegetables throughout the year, heirloom tomatoes are his favorites. Bradley farms because he loves to eat and cook what he raises. 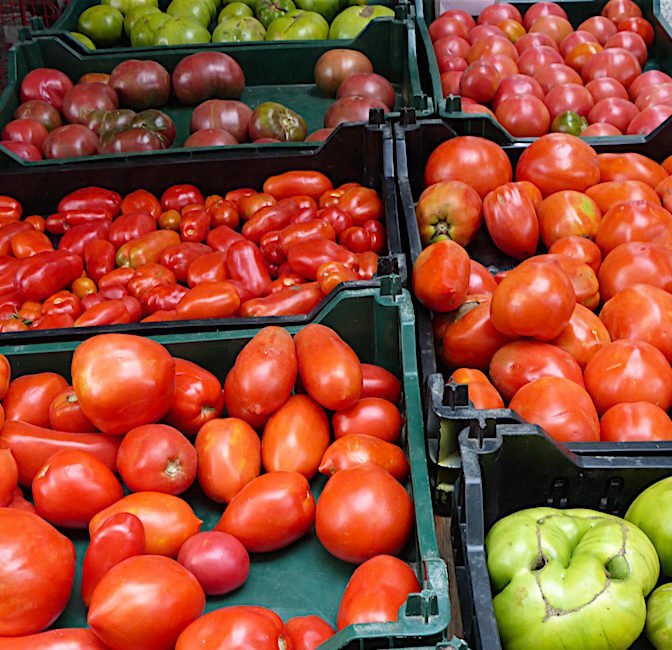 As it turns out, tomatoes, with their short season, have become a primary cash crop. 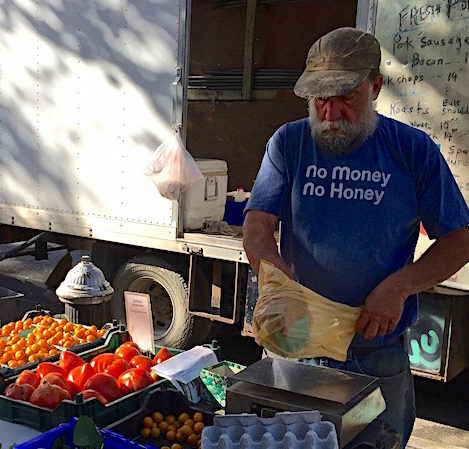 One of the best things about shopping at a local Farmers’ market, besides all of the fresh, organic and flavorful vegetables, is talking with the people who grow that food. Each one has a back story, none more compelling and meandering through the food world than Ray Bradley. With a cooking background that ranges from Cape Cod, Shelter Island, Florida and Costa Rica and includes stints at Le Cirque, Montrachet and Bouley in Manhattan, he moved into farming in order to grow his own organic vegetables. 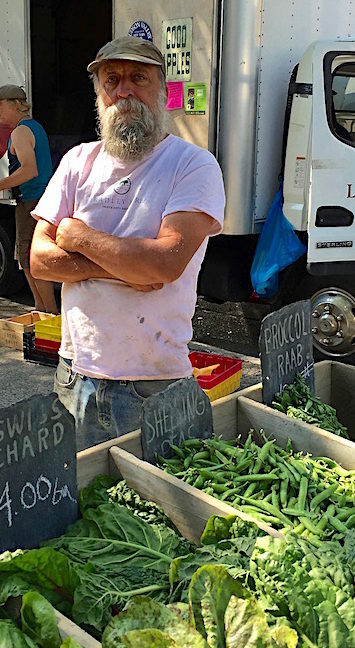 The full bearded, hardworking Bradley drives from his upstate farm to the 97th Street Market in Manhattan on Fridays during the summer and fall and to the Grand Army Plaza Market, in Brooklyn, on Saturdays year round. The life of a farmer is fraught with difficulty and Bradley’s plight has been no different. He has had floods and droughts, pests and plant diseases but the good years seem to outweigh the bad, overall, he says. 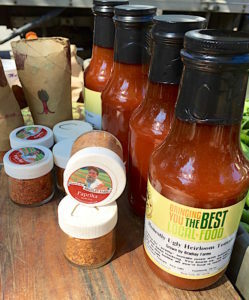 In order to bring in more income, Bradley has been an innovator with products – he makes and sells his own paprika and tomato juice – and events. 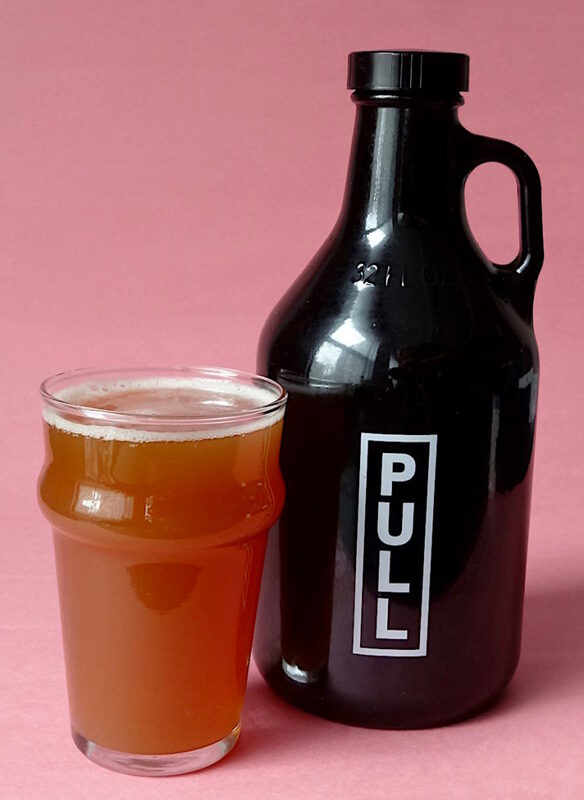 His farm is now known for its on-site, guest chef cooked dinners, often with wine pairings, pizza or grill parties showcasing his farm products, including farm grown salads and his own pork, beer and spirit tastings featuring his own farmhouse ale, as well as a farm stand. Just last week, he hosted a BLT and beer afternoon to celebrate the tomato harvest and his just-smoked bacon. Currently, he is running a raffle to raise money to build an outdoor wood-burning oven to expand his on-farm cooking possibilities. 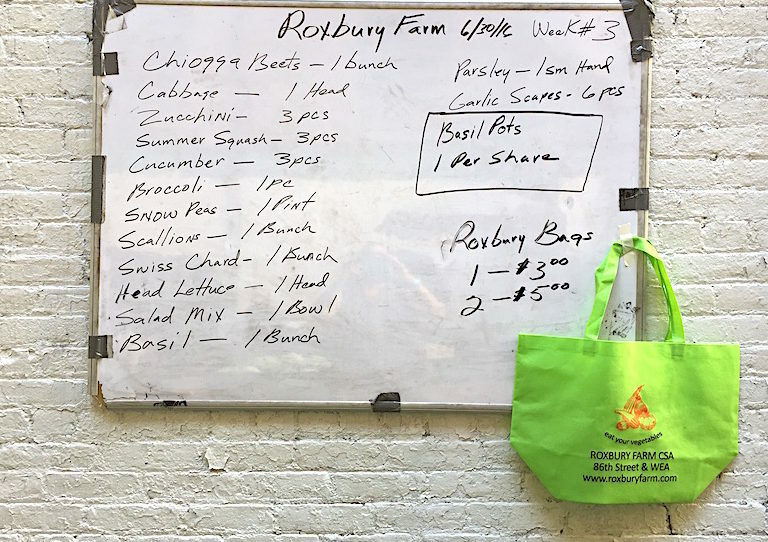 Bradley grows and sells the usual vegetables – broccoli, lettuces, onions, zucchini, peas, beets, parsley, potatoes and cabbage – that you see at most farm stands, although with Bradley, the varieties are specific to his tastes. The only potato he grows, for example, is the Carola, a small yellow-fleshed type, because that is his favorite. 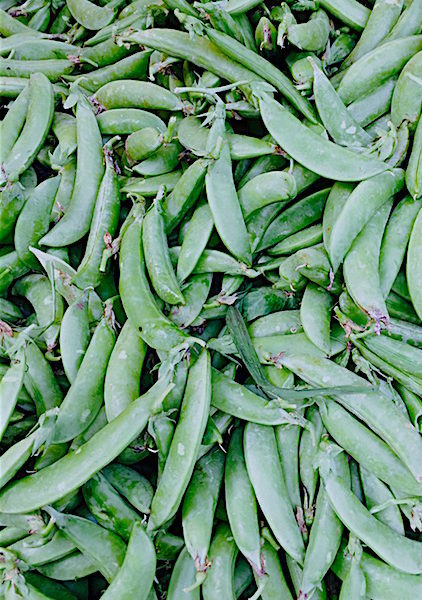 But, perhaps as a result of his culinary experience, he also grows a wide variety of less ordinary crops – flat Italian pole beans, fennel replete with fronds, French gray shallots, haricot vert (those delicious skinny green beans), sweet delicata and buttercup squash, fava beans, bush basil (tiny, spicier leaves), sorrel and purslane, a small-leafed lemony green. 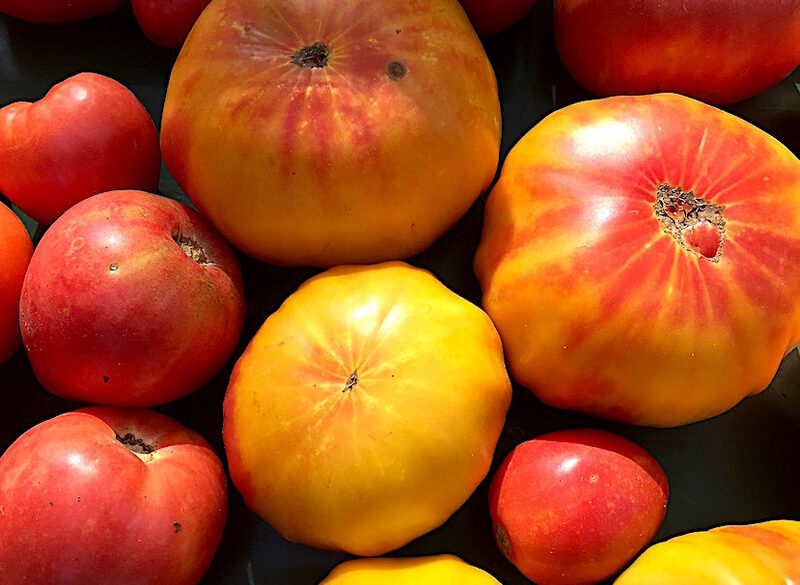 But his best sellers, by far, are his heirloom tomatoes, which range in size from tiny and round to huge and rippled, and in color from pale green to orange to red to purple. Whether oblong or circular, Bradley’s heirlooms are full of flavor. He credits this to both the quality of seeds and soil and the way he raises them. He plants the seeds he saved from the previous year’s crop (when he finds a particularly good tasting tomato, he dries and saves those seeds) in April. By May, once any chance of frost has passed, he is transplanting small seedlings into the ground to give them the best chance of putting down good roots. 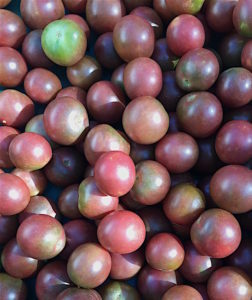 Besides starting with good seeds and amending what was good soil to start with, perhaps the main reason his tomatoes are so flavorful is that he doesn’t water them – he says that is what develops the intensity of flavor. Whatever the cause, the tomatoes are delicious – we’ve been eating lots of them with just a simple vinaigrette and sprinkle of fresh basil or oregano. Bradley eschews vinaigrette, preferring not to mask the taste of his tomatoes. When we eat his heirlooms mixed or side by side with other tomatoes, the difference in flavor is obvious and the Bradley’s win every time. Besides heirlooms, Bradley grows more ordinary cooking, husk and cherry tomatoes. It’s hard to stop eating the small yellow/orange or red/green cherries from Bradley’s farm – they are sweet and addictive and I rarely get them into a salad because we devour them straight out of the paper bag. 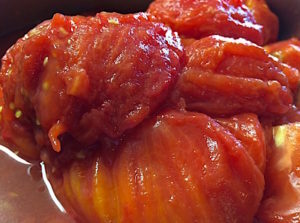 Bradley says he uses a tomato peeler with a serrated blade to peel the large tomatoes which he then freezes so he can make fresh sauce during the winter, although sometimes he just tosses them into the freezer whole. 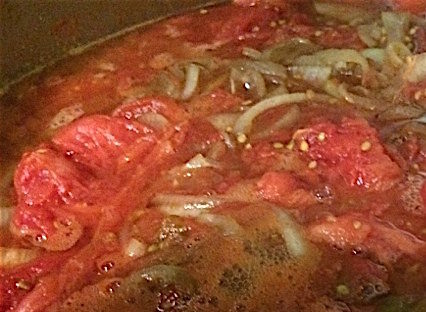 When the weather is cool enough, as it is this week, he can make sauce to use in cooking once the season has passed. That way, he can have fresh tomato flavor throughout the year. After all, the reason Bradley grows these gorgeous tomatoes in the first place is because he loves to eat them. Lucky for us! Score (cut an x) whole tomatoes with a sharp knife. Place on a rimmed baking sheet and drizzle with olive oil and sprinkle with salt and pepper. Roast until skin is peeling off. Remove skins and put in a pot with some sautéed onions and garlic. Simmer until they begin to break down. Cool and put up in glass containers. Ray suggests sautéing a little onion and garlic and adding the sauce to them to re-heat when ready to use. Although I love certain things about summer in New York – looser schedules and clothing, the way our neighborhood empties out and how weekends are much quieter, even peaceful at times – I can’t stand the heat and humidity here and aging only seems to make me less tolerant. (I really should live somewhere near the Arctic Circle). There are, however, a few things about city summers I think of happily and gratefully – more frequent and welcome visits from out-of-towners, outdoor music all over the city, a drink on a rooftop terrace or on a pier by the river, a drive to Maine to visit friends or a weekend with Mom in Connecticut, either of which might include a swim or blueberry picking. 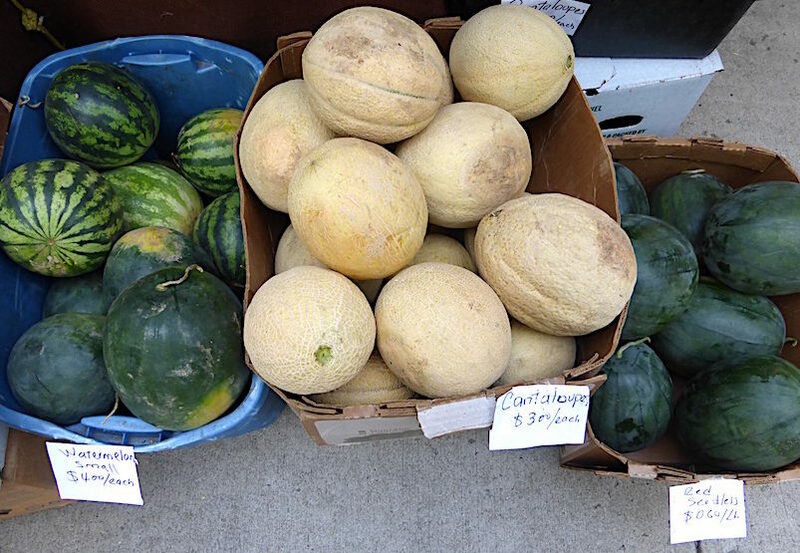 Beyond these highlights, one steady and really bright spot of the week – in my constant search for a cool, shady spot – is our local Friday farmers’ market. Just walking through the 97th Street Greenmarket early on a July morning is enough to make me forget I am hot. 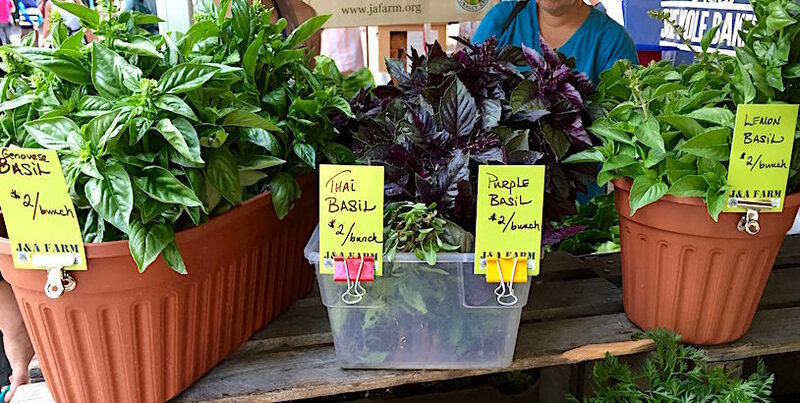 Not only are the overflowing farm stands gorgeous in their reds, yellows, and all shades of green but they are incredibly fragrant in a good way. I can’t often say that about any part of New York, which is frequently fragrant but certainly not in any way we would choose! 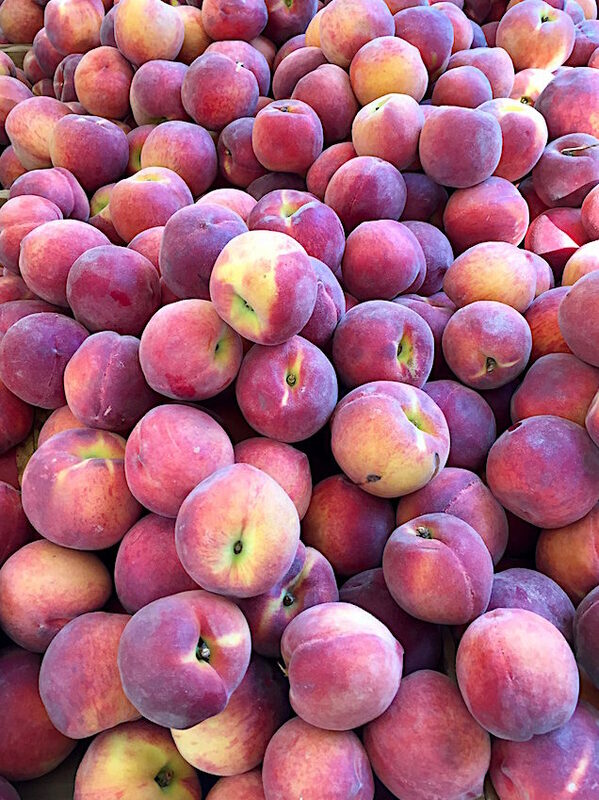 This market is perfumed with ripe peaches and sweet basil and makes me heady just breathing normally. Sometimes it’s all so tantalizing that I can’t restrain myself and I get home with more than I can fit in my refrigerator. Yellow, green and purple beans, yellow, red, green, purple and even white tomatoes, obscenely large heads of lettuce and broccoli, the first tiny kerneled white corn, mild garlic scapes and freshly picked garlic bulbs, not yet dried, all fill my bags. I am no longer embarrassed to bring what I used to consider an “old lady” shopping cart, as it means I can get more home without hurting my back! 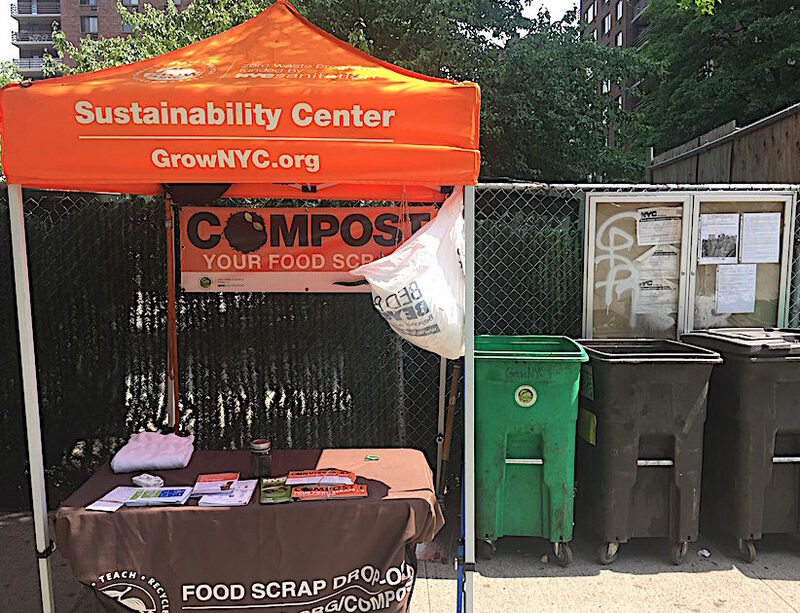 And I feel virtuous because I can drop off textile recycling as well as all of our food scraps into bins to be composted, a simple act that has reduced our trash by more than half. Besides vegetables, our market also provides me with cage free eggs (from chickens who actually run around and scratch and eat bugs), pork chops, slab bacon and pork roasts from a chef turned farmer who now farms and raises pigs upstate – Ray Bradley. Ray is also my source for tender fennel, all kinds of herbs, squashes, Italian pole beans, haricots vert, juicy, extremely flavorful heirloom tomatoes, yellow potatoes, onions, garlic, paprika, pickles, and occasional flowers. You will read about him in a future post. New York State grass fed beef is hawked by jaunty, usually bearded and mustachioed young guys, while spicy turkey sausage, necks and backs for soup, and my Thanksgiving bird are supplied by a family-run, New Jersey-based turkey farm. We get milk, yogurt and unsalted butter from grass fed cows from Pam, who lives nearby but sells for Ronnybrook every week very dependably no matter the weather. I buy every variety of local berry one could imagine as well as musk and watermelons from Jorge, transplanted from Colombia to Pennsylvania and who, thankfully, eschews pesticides. He grows all kinds of leafy greens, sweet cucumbers, snow peas, hot peppers and purslane (which I had previously thought was just a weed but adds a lemony flavor to a salad), eggs, pumpkins, corn, and yellow, red, and purple potatoes that will keep, like his winter squashes, for months. 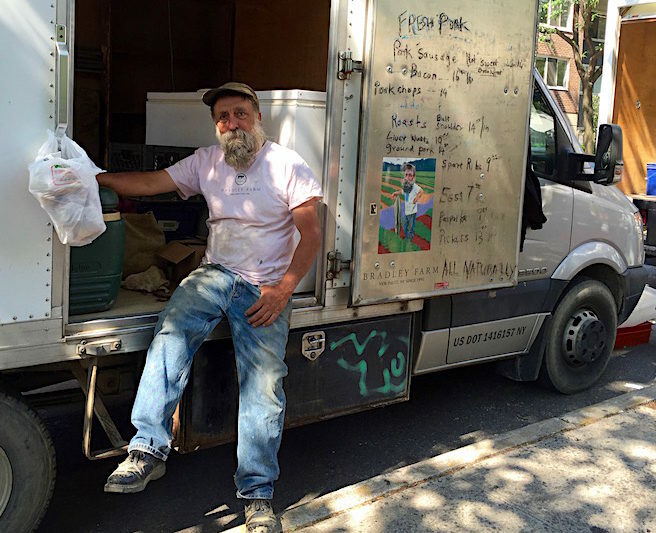 When this local Greenmarket began years ago, before every neighborhood food store had fresh sourdough and ciabatta, we could buy great bread from the Tribeca Oven stall manned by Alan Cohen, whose son Keith trained at Tribeca and went on to buy Orwasher’s, an old time bakery still putting out a delicious seeded rye and Russian pumpernickel with a new west side store opening soon on Amsterdam Avenue. Now we can buy exotic loaves (baked by immigrant women who have been trained uptown to make the breads of their home countries) at the Hot Bread Kitchen stand and toothsome and tasty whole grain sourdoughs from She Wolf Bakery. We get our choice of every type of apple and pear I can imagine, along with cherries, berries, plums and other stone fruit, even into the winter months from Locust Grove Farm, now run by brothers I have watched grow from teenagers at the nascent Union Square market into middle age to take over their farm and broaden its market sales. Jeff Bialas, who grew up in a traditional farming family but started the J & A Farms in 2010 to farm organically, grows many kinds of greens, like tatsoi, bok choy, mustard and dandelion greens, arugula, purslane and sorrel, along with the more widely available but flavorful beans, lettuces, turnips, fennel and many types of herbs. Buying directly from markets reminds us of all the work involved in producing and delivering our food. When I see groups of pre-school and kindergarten kids talking with the farmers and sellers, I feel happy that they are learning that their vegetables don’t just grow on supermarket shelves. Plus this market takes food stamp vouchers so it is accessible to a wider range of residents. Most of the farmers or sellers are set up before 8, when the market officially opens, so it is possible to shop and still get somewhere by 9. I run into friends and acquaintances from the neighborhood, parents and teachers from my son’s various schools and sports teams, other artists who live nearby, even people who live in nearby buildings who I don’t know well but chat with at the market, finding a connection amidst the fruits and vegetables. With all this gorgeous, fragrant and healthy produce and community, it is easy to forget the heat and appreciate the abundant bounty of summer. 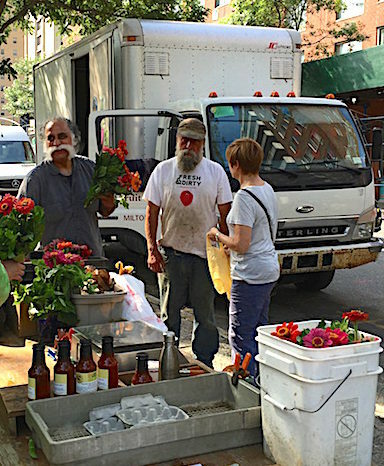 To find a Greenmarket in New York near you, check their website at grownyc.org/Greenmarket. 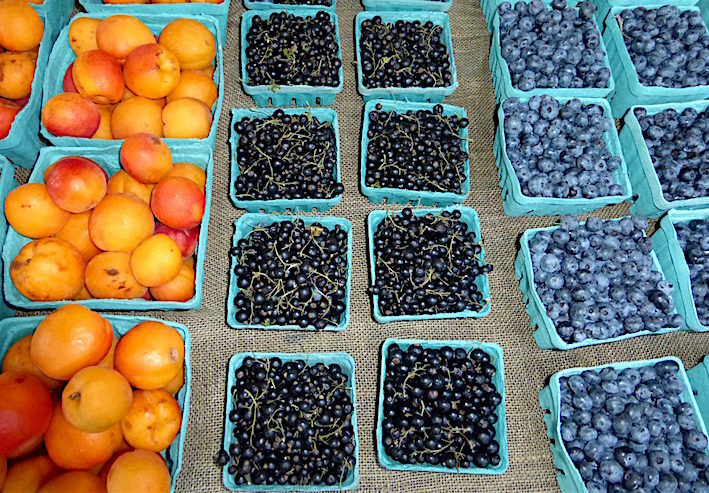 With the explosion of farm-to-table eating, farmers’ markets have sprung up across the country. Surely, wherever you live, there is bound to be one nearby. Tell us about your favorite! Taking time to make a meal is a choice. Plenty of options exist, like prepared foods, take-0ut and delivery, yet I choose to cook when I am able. Cooking and sharing meals is a way to express care and connect with others. Buying handmade pottery is also a choice, and one I do whenever possible. Using pots made by hand reminds me to slow down and appreciate what I am eating or drinking and makes a meal feel more celebratory. Those pieces feed a hunger for the handmade, for intimacy and for beauty. 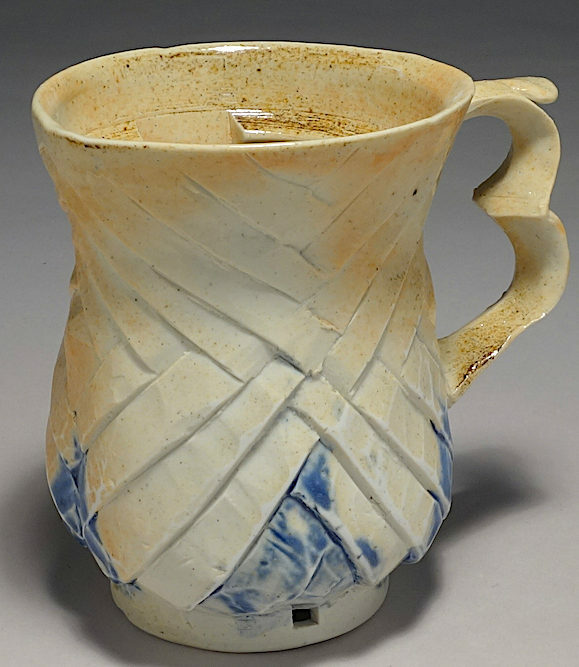 I love to sip my morning coffee from a hand-crafted mug that feels just right in my hand, put flowers on the table in a graceful vase or serve a salad in a generous wheel-thrown bowl. There is something personal about using handmade dinnerware that makes food look important and feel special. After all, it was made by hand by a person! Sure, there are loads of beautiful objects that are industrially produced. Some of the bowls I use every day come from Ikea and our oval, factory made, diner-style plates are from the Bowery Restaurant Supply. It is the handmade pieces we use, however, which make a meal, or even a cup of tea, seem significant. At least in Manhattan, handcrafted pots are rarely available to buy retail anymore except at seasonal craft fairs or studio holiday sales. We used to have lots of small shops and galleries where you could buy handmade pieces but they are mostly gone, probably due to rising rent. When you can find them, in upscale shops or museum stores, the pots are usually at the highest price points of the artisanry market. Fortunately, we have been able to find places selling ceramics when we travel, having had luck in cities from Chattanooga to Copenhagen. ( I will compile a list of outlets and post it soon – please share any sources you know). Some of our favorite travel keepsakes are handmade pots. For example, my husband bought a lovely hand painted porcelain tumbler in Montana last summer (I think it was $60). Every time he uses it, and that is daily for almost a year, he enjoys its beauty while it reminds him of what a good time he had on that trip. Part of the problem may be cost. Have we become so used to discounted prices for cheap, imported manufactured goods that we balk at buying a handmade cup for $40 (but spend $4 or more on a cup of coffee regularly)? Are we happy to go out for a pricey brunch but are offended at the cost of an artist-made cereal bowl? Or purchase expensive, factory-made sets of china but think it outlandish to spend the same money on handmade dinner plates? Studio rents in places like New York skyrocketed years ago so artists have had to move further afield while trying to make a living selling their work. The balance to the high cost of a unique piece is the satisfaction and repeated pleasure in its use. 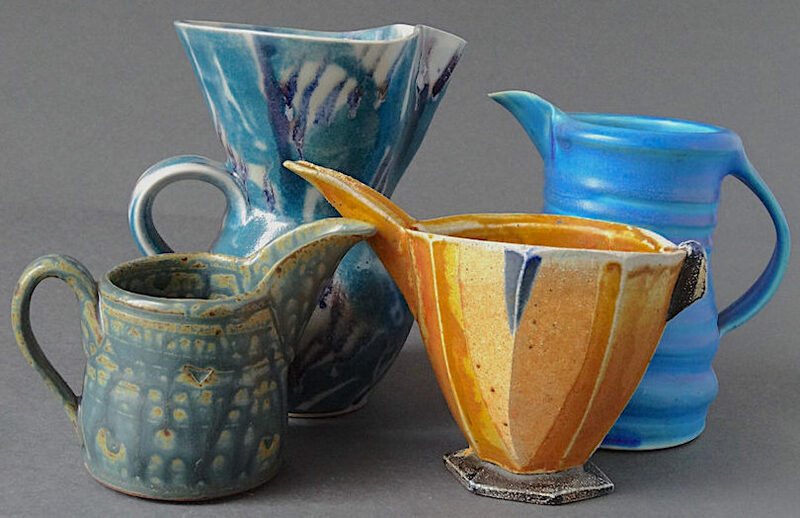 The good news is that there are still lots of working potters out there and many have websites through which to buy their work. Prices vary widely as do colors, techniques and styles so there are lots of pots from which to choose. 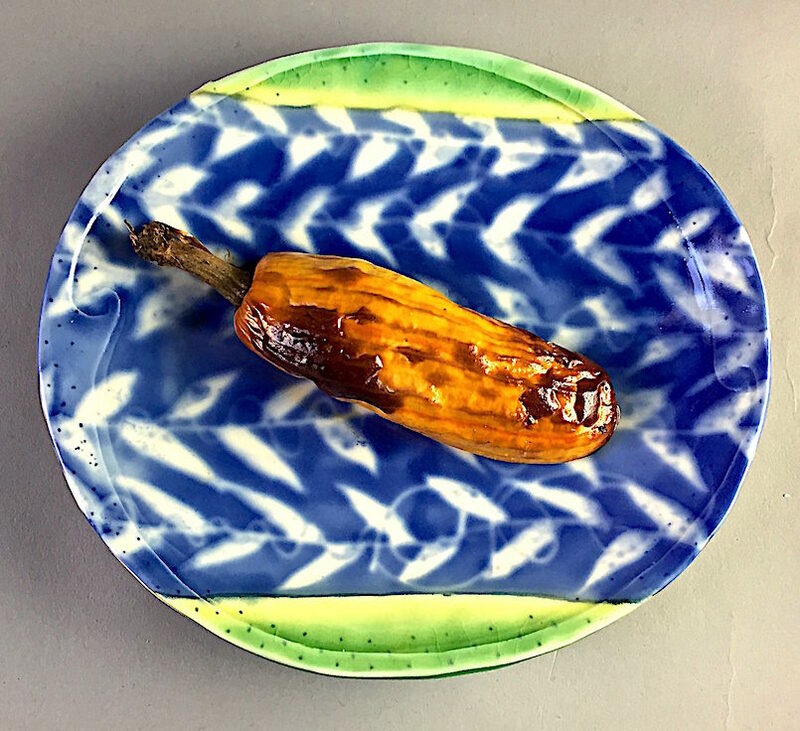 In A Good Dish, I will routinely highlight the work of interesting potters and how to get in touch with them to buy their work, a resource for you not only when you need a simple recipe for dinner but when you want to buy handmade pottery to use or to give as a gift. 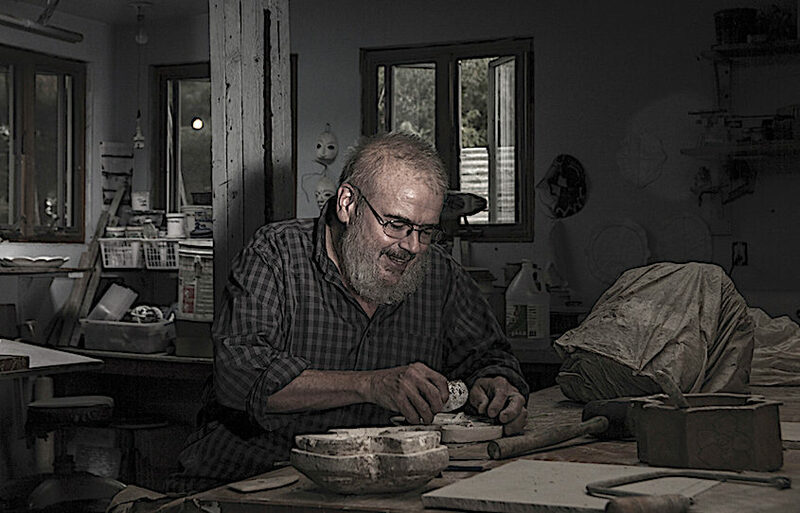 Because I have been a potter for decades, I have lots of pots – both my own and those of other potters that I have collected over the years – and I use them often and will use them here, whenever possible, to plate the recipes I post. In this way, you can glimpse the wonderful wares of potters from all over the country and from other countries. When a pot in a photo is uncredited, the piece is probably historic, mine, unsigned or commercial. If you are only using IKEA plates or mass produced dishes, as beautiful and practical as they might be, I encourage you to incorporate some handmade pieces into your daily routines – a coffee mug or teacup is an easy place to start. You might be surprised at how much more you will enjoy what you are eating or drinking.